If you've been on Pinterest for a half of a milisecond, you've probably seen the pinspiration for the kids' preschool Valentine's. I'm posting this for three reasons: 1.) 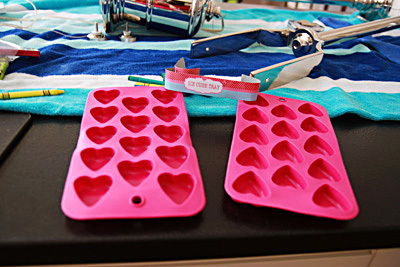 This is the easiest DIY valentine you could ever make; 2.) I found a free printable that makes it even cuter; and 3.) The Target dollar bins have the silicone ice cube trays right now. 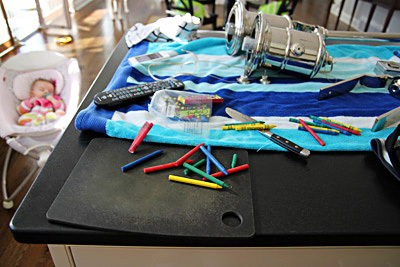 These took about 90 minutes to make, from first crayon to last stuffed gift bag. The whole thing is super simple too. 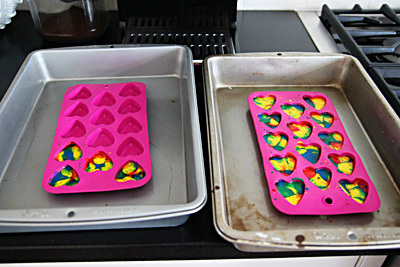 Just peel and chop crayons -- I used leftovers from our birthday party favor baskets -- put the chopped up crayons in the ice cube trays and bake at 230 degrees for 15 minutes. Let them cool and voila! 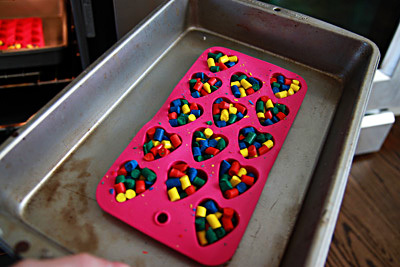 heart shaped crayons. The free printable is available through The Long Thread. 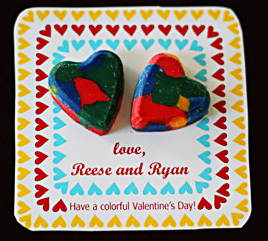 I opened the PDF in Photoshop to add the kids' names to the cards and to erase the center heart since I was affixing two crayon hearts (because they are valentines from two kids, of course). 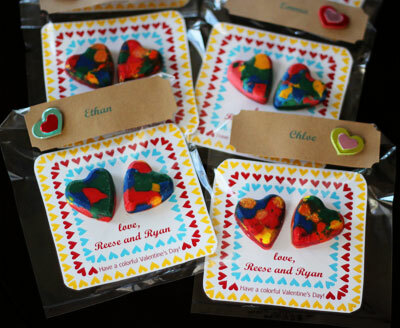 They print four to a sheet, and I just cut them out by hand and used zots to affix the crayon hearts. I stuffed the crayon cards into glassine bags I had leftover from their birthday party last year, you can find these cheaply at Michael's and Target also had some in their dollar bins too. 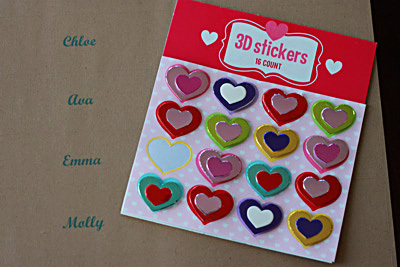 Then I quickly printed off some name tags using leftover kraft labels and jazzed them up with another Tarjay dollar bin find, 3D heart-shaped stickers. My grand total for 11 valentines was $4. Sweet. And the finished product ready for their preschool party.